Back-Up Story: "The Origin of Booster Gold"
Day 1: Oliver (Green Arrow) Queen, in the midst of running for Mayor of Star City, takes a call on an old JLA signal device frequency. It's Firestorm and he wants to invite Ollie to join the new JLA which consists of Firestorm, Firehawk, Super-Chief, Bulleteer, and Ambush Bug. Ollie turns him down. Firehawk tells Firestorm to ask Green Arrow if he knows where J'onn J'onzz is - Ollie doesn't. No one has seen J'onn for almost six months. Day 2: At the original JLA Secret Sanctuary in Rhode Island, J'onn constructs a statue of Booster Gold to join the memorial of fallen Leaguers - including Ice, Rocket Red, Vibe, Maxima, Red Tornado, General Glory, Tomorrow Woman, Flash (Barry Allen), Amazing Man, Sue Dibny, Wonder Woman (Hippolyta), the Crimson Fox(es), and Blue Beetle. J'onn talks to Booster as he relates how he went undercover as an advisor to the President and in other political roles to ensure that the powers that be ultimately disbanded Checkmate, the organization that Maxwell Lord took over and started into motion the events of "Infinite Crisis". Day 3: Black Adam, Isis, and Osiris are in China. Adam is there to tell the Chinese meta-team, the Great Ten, that he has dissolved the Kahndaqian coalition and will no longer be violently executing metahuman criminals. The Great Ten accuses Kahndaq of being run by Isis. Adam gets angry but Isis reminds him of the danger of Pride (one of the Seven Deadly Sins). Before the Black Adam Family leaves, August General of the Great Ten tells Adam that his decision disappointed a great many powerful people. Adam ignores the veiled threat, countering that he, Isis, and Osiris are powerful people. Day 6: Firestorm talks to Professor Stein. He resents Firehawk for refusing to merge with him during the Crisis which led to Firestorm's friend Mick dying in the Firestorm matrix. Suddenly Super-Chief's totem lights up signaling to the League that there's trouble. Cyborgs and pirates are attacking and the new Justice League rushes into action. Firehawk notes that most of the civilians scattered quickly so casualties should be low. However, the real reason they scattered was to change into their super-heroic identities as dozens of Lex Luthor-made super people spring into action. During the confusion, Firestorm runs into Skeets. Skeets reveals he created this melee to draw out a hidden enemy. He tells Firestorm he's going to up the ante as he blasts Firestorm, then blasts many of the heroes and civilians below. Super-Chief tries to stop Skeets but Skeets creates a localized chronal acceleration in Super-Chief that runs up his one hour of power and disintegrates him. Super-Chief's spirit returns to the spiritual plane. An Indian priest collects Super-Chief's mystic necklace and holds it in front of Ralph Dibny and Dr. Fate's sentient helmet as he tells them that magic never comes without a price. Day 7: In the Oval Office, the U.N. Ambassador looks at the Daily Planet with the President. The headline is "Metropolis Massacre". The new JLA disbands. The Ambassador believes this is why Checkmate is needed. The President refuses to reinstate Checkmate. The Ambassador tells him that it doesn't matter what the US does; the U.N. has recertified Checkmate as a U.N. agency with even more power. J'onn stands hidden in his identity working alongside the President - he's been stymied. At Belle Reve Federal Prison in Louisiana, Amanda Waller doubts Black Adam's motives in throwing away his alliance in the name of his family. She believes Black Adam is up to something and she wants Atom Smasher to go into Kahndaq with a team of super-villains for an as-yet unknown reason. Atom Smasher tells Waller that Adam will kill him. Waller reminds him that he turned himself in to make amends for the lives he took while working with Black Adam. Waller and Atom Smasher look over photographs of super-villains as she asks him who's going with him on this mission. In the 25th Century, Michael Jon "Booster" Carter was a football star until he got caught betting on his own games. He eventually ended up as a night security guard in a space museum. He used artifacts in the museum to create a new identity for himself and he used a stolen time machine to go back to the 20th/21st Century where he became Booster Gold. Booster was aided by the robotic Skeets who was a security 'bot in the museum. Main Story - 4: Finally we see some of the big guns. It's a year without Superman, Batman, and Wonder Woman but there's a lot more A-list heroes beyond the Big Three so it's nice to finally see some of them in action from Oliver Queen to the Martian Manhunter to Firestorm. 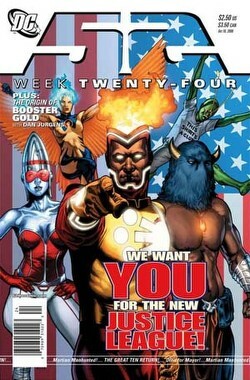 Speaking of Firestorm, it's too bad he's been made out to be so inept as part of this JLA abomination. Dwayne McDuffie, animated JLU creator and creator of "Static Shock", will be taking on Firestorm with the specific goal of improving his stature so it's unfortunate that the new Firestorm will have to overcome this blunder in the eyes of fans. It's really great to see Ambush Bug again. Irwin Schwab has the power to teleport as well as a general awareness that everything around him is going on in a comic book, a very useful power to have when that's where you live. And Ambush Bug started out as a Superman villain in 1982, first appearing in DC Comics Presents (a Superman team-up book) with subsequent appearances over the next few years in Action Comics and Supergirl before he earned his first of several solo comics and mini-series. Ambush Bug is a creation of Keith Giffen so it's nice to see the Bug return to active DCU duty as Giffen himself has as well. So long as he doesn't appear too much which is what made fans and DC turn their backs on him for so long. Characters like Ambush Bug and Lobo make wonderful supporting characters because they breathe fresh life into the more iconic and static heroes they appear alongside. But, for the same reason you don't give Kramer from "Seinfeld" or Fonzie from "Happy Days" their own show, you appreciate these types of second banana characters in their second banana roles. Harley Quinn anyone? Atom Smasher, formerly Nuklon, appears headed toward a stint with a new Amanda Waller-led Suicide Squad. That doesn't bode well for one of the DCU's only Jewish super-heroes. I hope he survives to join the new "Justice Society of America" - he deserves the chance to redeem himself. Art - 4: Phil Jimenez without the fanfare of being the "Infinite Crisis" guy - being just another artist contributor to "52" - does some of the best work I've ever seen him do. The art is certainly less derivative of George Perez's artwork than anything Jimenez has done for DC in the past few years - and that's a good thing. Perez is great. And that similarity was good for "Infinite Crisis" to effectively book-end it to the original "Crisis on Infinite Earths". But this feels more original - maybe it's the input of breakdown artist Giffen. Whatever it is, I'd like to see more of this Jimenez. Backup Story - 2: This is an exceptionally disappointing origin story. Given Skeets' role in the lead story, his role in Booster's origin deserved a closer look than one mention in the story's last panel. In addition, it would have been nice to see some mention of his role in naming Doomsday during the Justice League's battle with and defeat at the hands of the creature - which left only Superman to stop Doomsday. No mention of Booster's death? That's another reason to think Booster's not so dead as we think he is. Art - 5: Booster's never looked better drawn here by his creator Jurgens. Cover Art - 4: Beautiful cover.